For cats over 12 years old with sensitive teeth and gums and a fussy appetite. Cats age in two distinct phases. During the first phase, there may be few visible signs to indicate the internal changes that are occurring. During the second phase (12 years+), ageing accelerates and cats may exhibit visible signs, including decreased mobility and dental sensitivities. *RENAL HEALTH Kidney disease is extremely prevalent in the ageing cat population and is one of the most common medical reasons older cats are seen by veterinarians. Indoor 7+ is reduced in phosphorus which helps support renal health. *HELPS STIMULATE APPETITE As cats age, it may become more picky. A declining sense of smell and taste can make food less appealing, while dental sensitivities can make it difficult to chew. 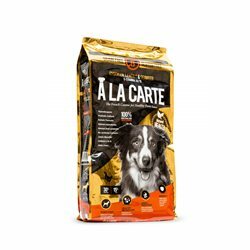 Ageing +12 has an exclusive combination of natural flavours and aromas, combined with a unique dual texture kibble design - containing a soft cream filling surrounded by a crunchy outer shell. 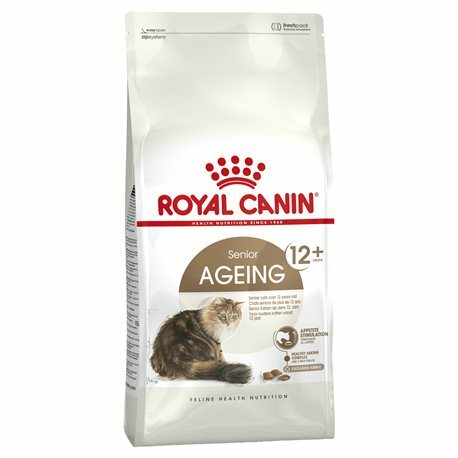 The nutrient and energy dense kibble is easy to chew and helps stimulate the appetite of an ageing cat, ensuring picky eaters are able to meet their daily nutritional needs. COMPOSITION: vegetable protein isolate*, precooked wheat flour, animal fats, rice, dehydrated poultry meat, vegetable fibres, hydrolysed animal proteins, maize, chicory pulp, soya oil, fish oil, minerals, tomato (source of lycopene), psyllium husks and seeds, fructo-oligo-saccharides, green tea and grape extracts (source of polyphenols), hydrolysed yeast (source of manno-oligo-saccharides), hydrolysed crustaceans (source of glucosamine), borage oil, marigold extract (source of lutein), hydrolysed cartilage (source of chondroitin). ADDITIVES (per kg): Nutritional additives: Vitamin A: 20100 IU, Vitamin D3: 700 IU, E1 (Iron): 46 mg, E2 (Iodine): 3.6 mg, E4 (Copper): 10 mg, E5 (Manganese): 60 mg, E6 (Zinc): 198 mg, E8 (Selenium): 0.08 mg - Preservatives - Antioxidants. ANALYTICAL CONSTITUENTS: Protein: 30% - Fat content: 19% - Crude ash: 5.2% - Crude fibres: 4.7% - *L.I.P. : protein selected for its very high assimilation. My cats are ageing and fussy eaters. I've tried many of the top brands, and even some of the other Royal Canin dry food, but they all prefer this particular type. I've had to sprinkle it on other food so they'll eat, sometimes.